I'm doing a public beta testing because it is the quickest way to find bugs and problems. 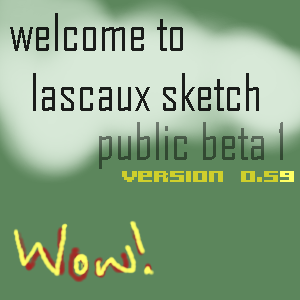 If you aren't aware of what Lascaux Sketch is, I urge you to go to the Sketch Studio Web site and check it out. You can also download the JTablet Plugin for windows, that allows you to use pressure sensitive tablet support. wow-ee. i tried the aplet. my main problem with it was the slowness. it might have been my computer, but the program didn't run very smoothly (thats why i didn't send a picture, it wasn't comfortable for drawing) Lascaux sketch looks very promicing. my suggestions are as follows: get rid of the lagy-ness(problem described above), make the color selectore smaller(we don't need it that big. half or 1/3 of the current size will do much better), add a watercolor tool/ setting, add a blur tool (not that i use it much, but i know people that do), have the default zoom be at 100%. i didn't really mess around with it too long, but i would like to do some more, so if i find any more problems or suggestions, i'll post them. i really hope this aplet gets as good as i think it will be, because it is the best attempt at a oekaki-type thing i've seen yet. color selector: this size is based on the window size, so if you make your window bigger, it takes up more room, if you make it smaller, it takes less. Is there ever going to be an "Animated" Lauscaux sketch..? It would be interesting to see how it works. Yes, animation support is already partially implemented, and will be part of the program by version 1.0, but I decided to leave it incomplete for the initial beta testing, since it's already a fairly powerful applet. this is a really great program...the selction systemis a little sticky but you adaopt and you move on. keep up the good (excellent) work. I didn't find anything wrong... but then again, I used only a few of the tools. Everything seems to be fine standardus. I enjoy the mapping and the selection of moves one makes. I concur that it is a powerful applet.